LeBron James gave fans at a youth basketball tournament the treat of a lifetime last weekend. Prior to his son’s game at the Bigfoot Hoops Las Vegas Classic on Saturday, LeBron joined the Blue Chips’ layup line and threw down a series of spectacular dunks. Naturally, fans in attendance absolutely loved it. LeBron might be the best basketball player of all time, but he’s never taken part in a dunk contest as a pro. Who wouldn’t want to watch him throw down a bunch of showtime dunks in an intimate setting? That’s not a rhetorical question. The answer is Skip Bayless. 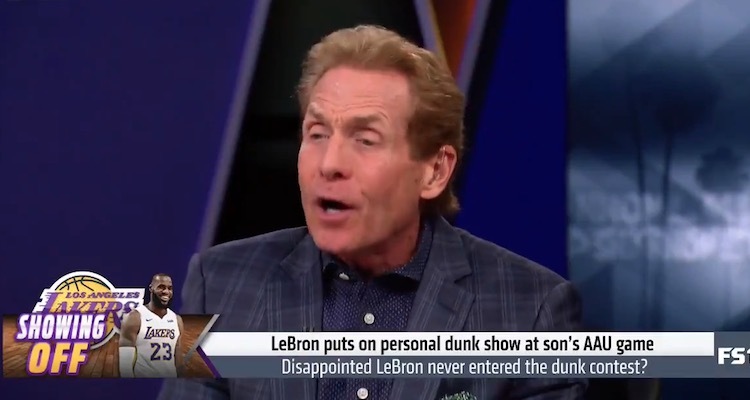 On Monday, while LeBron was in Akron cutting the ribbon on his new public school for at-risk children, Skip Bayless was in the studio tearing him a new one for having the audacity to use his God-given talent to entertain people. “Finally, after 15 seasons, LeBron James finally participated in and won a dunk contest … against 13-year-olds, against seventh graders! Before his son’s game. And I’m saying when I saw this last night, ‘What are you doing, LeBron?’ I nearly fell off my chair when I thought was this somehow Photoshopped-CGI-Mission-Impossible stuff? No, it happened! This was just so pathetically wrong on so many levels because first of all, his namesake son, 13-year-old LeBron James Jr., is obviously trying to make his own way in basketball. He’s trying to make a name for himself. And all of the sudden, his father is in their layup line doing contest dunks — not just shooting layups like the kids are shooting. He’s doing contest dunks. Skip Bayless is the greatest sports troll of all time. LeBron could take a bullet for a bus full of nuns and Bayless would accuse him of attention-seeking.